Desiccant air filters and humidity air filters all in one. Desiccant filters were developed to work in conjunction with existing air conditioning systems, in the commercial and residential marketplace. When properly maintained Desiccant air filters never wear out and never need to be replaced. Recognizing the link between “balanced humidity” and “energy efficiency-power savings” , Desiccant filters are a greener, cleaner external non-mechanical air conditioning and refrigeration systems accessory, for the commercial, industrial, institutional, and/or residential home sectors. Desiccant filters are made up of special non-chemical, non-toxic coolant and adsorbent filtration minerals that continuously (even when the compressor cycles off) removes water vapor from the air and to lower the dew point in order to prolong the stability of humidity in the air. Desiccant filters buffer changes in humidity by adsorption of water vapor (latent heat) to prevent dew point levels. Typically, within hours after being installed, temperatures will move lower, the relative humidity will stabilize, and the dew point will be controlled to eliminate further condensation. This leaves the air feeling cooler, crisper, and more comfortable so less energy is needed to lower temperatures. The products contain 100% all natural zeolite blends. Natural volcanic zeolite is a mineral consisting of silica and alumina. There are large deposits of volcanic zeolite minerals found in the western United States. Natural zeolites have a unique interconnecting lattice structure. This lattice structure is arranged to form a honeycomb framework of consistent diameter interconnecting channels and pores. Negatively charged alumina and neutrally charged silica tetrahedra building blocks are stacked to produce the open three dimensional honeycomb framework. Zeolites attract positively charged moisture, odors and gas molecules and trap them in its crystaline structure. Natural zeolites are formed from the altered volcanic ash. Zeolites have the ability to adsorb and desorb water, odor and gas molecules without any chemical or physical change in the zeolite itself. The material can encompass and control many times its weight in odors or moisture. Zeolites are safe, inert, stable, non-toxic and non-corrosive. The process by which zeolites attract and trap moisture, odors and gases is called adsorption. Absorption (with a B) is a mechanical process - for example, a dry sponge responding to water by expanding and holding the water. Adsorption (with a D) is the electrical process (ionic) of opposite electrical ions attracted to and clinging to each other. The zeolite minerals are 100% natural. Desiccant filters are a one-time purchase. If properly maintained, Desiccant filters never wear out and never need to be replaced. Zeolites are characterized by the ability to adsorb and lose water and gases without damaging the crystal structure. Zeolite minerals never wear out. Large desiccants need to be taken out once every 6 months and Freezer/Frig panel once a month to dry out. Note: Filters are custom fabricated, no returns or refunds. How do the zeolite minerals keep from becoming saturated with moisture? 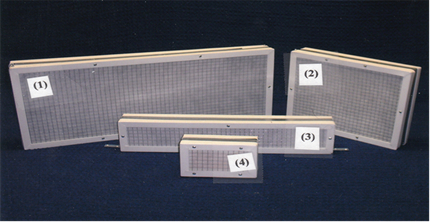 Desiccant filters work in conjunction with existing air conditioners. It's not in competition. The air conditioner is removing most of the moisture. Desiccant filters remove the additional moisture remaining in the air (latent load), giving the air conditioner back the sensible load. This is how Desiccant filters keep from becoming saturated with moisture. When the humidity is less than 50%, it releases moisture back into the air. This is the self drying mechanism. If heat is turned on in the building, this acts as an additional drying mechanism. What is the static pressure of Desiccant air filters? The static pressure is different for every air conditioning unit because the amount of the air intake vent that is covered by the Desiccant air filter is different. The rule is to not cover more than 50% to 60% of the air intake opening. If this rule is followed, there's no change in the CFM (cubic feet per minute). Will Desiccant filters always save money on energy costs? No. If the air conditioning capacity is inadequate for the building, Desiccant filters will not save money on energy costs because the cost savings are achieved by moving up the thermostat. Air conditioning capacity is typically calculated assuming 80% building occupancy. If this is the case and the building is 100% occupied, a lot of times the occupants will complain that it's not cool enough inside. Installation of Desiccant filters will result in the excess moisture being removed and the air feeling cooler and the occupants may say they now feel comfortable. However, since the thermostat wasn't moved up, very little or no energy savings will be achieved.